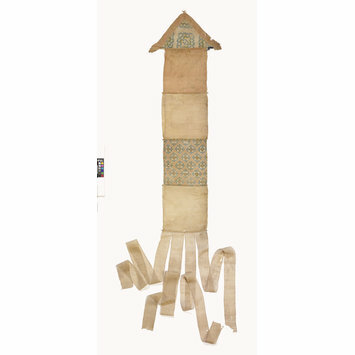 This silk textile is an incomplete Buddhist ritual banner. Such banners were carried aloft hooked on a staff and they also fluttered from the tops of stupa (domed memorial shrines). It was recovered from Cave 17 of the Mogao Grottoes, situated near the oasis town of Dunhuang. This shrine site is one of China’s great Buddhist pilgrimage complexes. Banner; head, four body panels and four legs intact. Head consists of a border of monochrome plain weave faded red silk and an infill of monochrome plain weave cream silk with a clamp-resist dyed pattern of floral lozenge-shaped clusters in blue, green, orange and yellow. There are also the remains of a string suspension loop. The first body panel consists of one piece of monochrome plain weave faded red silk. The second panel consists of one piece of monochrome plain weave yellow silk. The third panel consists of one piece of monochrome plain weave cream silk with allover clamp-resist dyed pattern of repeating floral lozenge shapes in blue and orange on faded red ground. The fourth panel consists of one piece of monochrome plain weave yellow silk. Legs of monochrome plain weave cream silk. 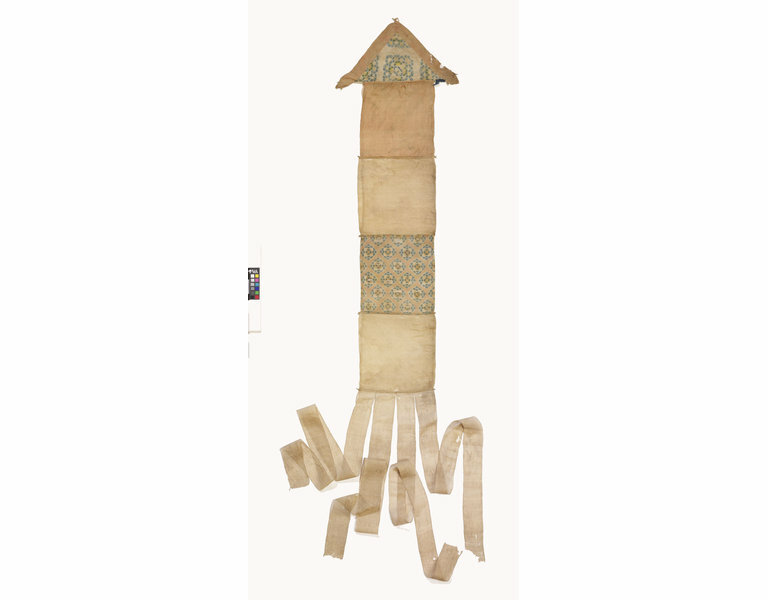 There are five split bamboo panel reinforcements intact and the remains of one monochrome plain weave blue silk arm. Zhao Feng, ed. Textiles from Dunhuang in UK Collections. Shanghai: Donghua University Press, 2007. pp. 268/269.